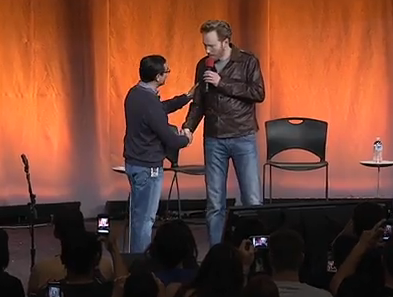 Conan O'Brien at Google. Hilarious. Honestly. Hilarious. Conan O’Brien at Google. Hilarious. Honestly. Hilarious. I must admit to not being the biggest Conan fan, I’m just not overwhelmingly convinced he’s as talented as everyone makes him out to be…BUT this might have just converted me. Him and Google’s Vic Gundotra should go on tour together, they genuinely bounce of each other wonderfully. Watch just the first few minutes, you’ll get sucked in. It’s not just the humor either. He shares some interesting insights into what things were like when the onslaught of support from the Internet arrived after his dismissal from the tonight show. PS. Conan is huge! Or Vic is tiny, one or the other.